Home » Who is at Fault in a Truck Accident? In New Jersey, who is responsible for a car or truck accident will have a significant impact on your ability to obtain compensation for the resulting damages. It is important to understand how courts of law, as well as insurance companies, decide fault when truck accidents occur. This article will take a brief look at some of the most important issues that are involved in these decisions. If you are involved in a car accident in New Jersey, you can file a personal injury protection (PIP) claim with your motor vehicle insurance carrier. PIP provides coverage for numerous damages including death benefits, lost wages, and medical expenses. If you decide on the highest-tiered type of PIP, you can also use this coverage to pay for other damages, as well. In many cases, however, it becomes necessary to obtain compensation beyond what PIP provides by pursuing a lawsuit. Determining fault is one of the fundamental elements of pursuing a legal action. It is also important to note that whether you will be able to pursue compensation in a lawsuit depends on the type of motor vehicle insurance policy you have obtained. While drivers with a limited insurance policy are often able to pursue legal action, you will likely only be able to pursue matters in a court of law if you have chosen a right to pursue legal action in your policy. Fault also plays an important role in deciding responsibility in car accident claims. New Jersey follows a modified comparative fault scheme. This means that if a person is more than 50% responsible for an accident, the driver will be unable to receive any damages. If you are less than 50% responsible for an accident, however, you will be able to obtain compensation. Decisions about fault can have a substantial impact on the amount that you receive after a truck accident. As a result, you should avoid the first response that insurance companies have about how an accident occurred. It is not in the best interest to readily pay for accident damages, which is why these companies frequently argue about how accidents occurred. A seasoned attorney, however, will be able to protect your rights by pursuing an investigation about how the accident occurred. Investigating a car accident often involves collecting photographs of how the accident occurred, law enforcement reports, eyewitness statements, camera footage, cell phone records, electronic data recorder information, and test results. If you have been involved in a motor vehicle accident, you should not hesitate to contact an experienced attorney who can help determine exactly who is at fault for your accident. 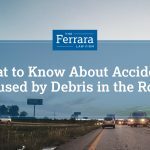 At Ferrara Law, we have significant experience collecting the necessary evidence to establish who is responsible for the car accident. We also have a track record of obtaining the results that truck accident victims deserve. Contact our law office today to schedule a free consultation about your accident. Injuries From Car Recalls: What Should You Do? We know that success in a personal injury lawsuit is not just about providing counsel, reviewing documents and implementing strategies — it's about going beyond the usual to achieve the best possible results in your case.